To many of us maps conjure up topographies of our world and topological surveys of countries or continents that serve a purpose of cartography or perhaps of propaganda. Yet aside from the additional aesthetical quality inherent in the artistry of these beautiful crafted maps, they also pertain a seductive element for any undomesticated imagination. Let me just begin by saying that the attraction of the pictorial mathematical geography of the world is an inexhaustible and boundless one for any human being that holds a fascination with traveling and mapping. And should there be the odd habit of mapping out your rural locale or metropolis you ought to take a look at the works listed below where the crossover between art and geography is indisputably apparent. 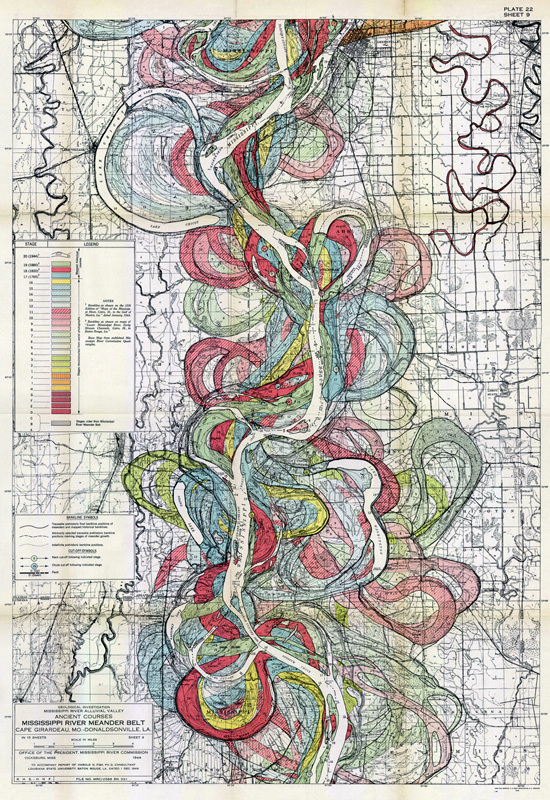 In 1940, the Army Corps of Engineers commissioned a cartographer, Harold N. Fisk to make a map of the various courses the Mississippi River has taken over time. He showed each course in a different color, to show when and how they happened. 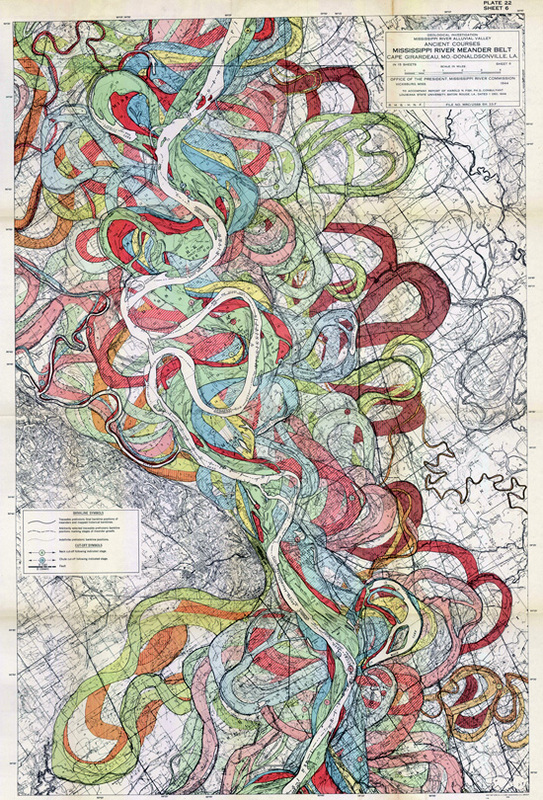 Each color represents the geological route the river had taken throughout the centuries and the concept of how sensitive is the role of the environment in shaping the relationship of man and land; whether that is an ecological and geological process, graphic representation, and ideological or philosophical implication of reconstruction. The result of this enormous body of work is simply unworldly in many levels. The visual impact from the aesthetic point of view of the work is impressive and it just goes to show that from mundane tasks beautiful works of art can surface and come to define, alter and view how we perceive the world. 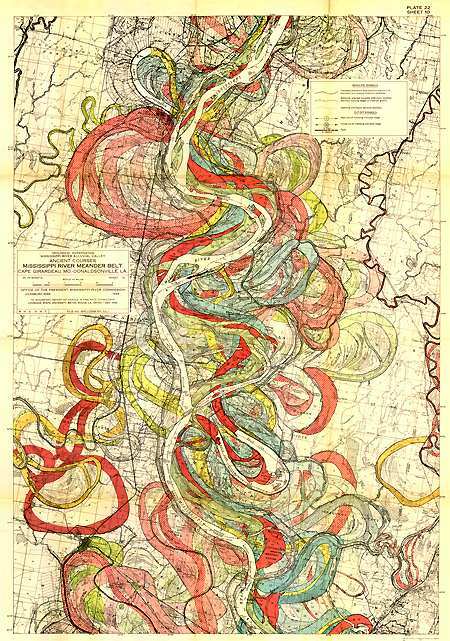 You can view online the entire volume of the continuous path of the Mississippi River here. You must download the geological plates in order to view the plates. We have a project for which this would make a wonderful book cover! Would you mind emailing me the information on where these prints are housed so we can investiage getting images and permission? That’s a great project! You can download these images from the link above which is open source so no charge. Make sure you download the ‘Fisk 44 Oversized Plates Rectified’ to get these particular plates and I’m sure you can get these printed and framed locally. Would be nice to see the end result!